When you're keen on eliminating wrinkles, a garment steamer is a perfect tool to use. Steam is great for helping the fabric's fibers to relax, removing wrinkles in an easy way. In addition, steamers are able to get wrinkles out of your own clothes in a much quicker, more efficient way. Steaming also works on many different kinds of fabrics! By heating water, these great tools use the power of steam through a nozzle, which relieves wrinkles when you apply it to your clothing. As a result, clothing steamers are becoming more popular, though they aren't as common as traditional irons. We're going to guide you through using steam on your clothes, as well as help you with choosing the kind of steamer that is best for your needs. You'll also be able to learn a couple steaming tricks for effective work! 1 How Do I Do It? 6 And, of course, get a steam mop! Many are aware that wrinkles in clothing can de-wrinkle by allowing them to hang in a bathroom around hot steam. A garment steamer is very similar to this method! All you need when you use a garment steamer is water, which makes it a very convenient tool to use. After filling it up and allowing it to heat for a few minutes, you'll be ready to start removing wrinkles from your clothing. When you're steaming, start at the top of your items and work towards the bottom. This method is simply more effective at removing wrinkles, and gives you a system to work by for every item. You'll also want to be extra careful with extremely delicate fabrics as well as those that have embellishments or other kinds if intricate design. The garment steamer works by applying the hot steam to your hanging clothes, which allows the fibers within the garment to relax. Consequently, the wrinkles are relieved and your clothes are left slightly damp. You'll definitely want to make sure to give them time to dry before wearing them. There are plenty of benefits you can get while using a garment steam cleaner rather than standard methods. The first is that not only does this steamy process get out wrinkle, but it can also kill germs, bacteria and even parasites that may be on your clothing at any given time. That also includes bacteria that can cause odor, according to The Laundress. As a result, it's great for leaving your clothing fresh and smelling clean. This also makes it useful when you may need to wear something more than once in between washes or trips to the dry cleaner. Great for business trips when you may not want to pay to wash your suit just once! On top of that, steam cleaning also works fantastically on other items around your home like furniture, bedding, curtains and a whole lot more. That allows you to keep those items clean in a very simple, quick and inexpensive way. If you live in a smaller space and don't have room for an ironing board, then a compact steam cleaner can be the perfect option. Pretty much anywhere you can hang your clothes, you can also steam them. Because of that, it's great for keeping things clean in small areas. Before you get going, it's important to know when to make use of your steamer. The good news is that most types of fabrics can handle steam cleaning very well, but some may not. It's wise to know the difference so that you don't end up damaging one of the items with a more delicate fabric. Among the fabrics that react well to a steam cleaner are polyester, cotton, wool and silk. These items can all be easily cleaned using the steam and shouldn't receive damage from them. Keep in mind that there can still be some stranger circumstances in which they may be damaged. On the other hand, fabrics that aren't going to handle steaming are suede, waxed jackets and anything that contains the risk of melting under the heat. Anything that includes materials like plastic isn't going to handle steam well. This can result in melting and damage to the garment. If you're unsure whether or not you can use your steamer on a specific item, it's worth looking up. Check any tags on the item and work according to the information about you can use on it. If you cannot find an answer, it's better to avoid steam cleaning it than to use it and risk damage to the item. While many of the more delicate fabrics can be steam cleaned, they still need to be handled very carefully. Extreme heats can cause a problem on some of these kinds of fabric. However, if you are very careful and handle the steamer correctly then you shouldn't have a problem. When you're steaming these kinds of items, you'll want to keep a little bit of distance between the item and the steamer. A few inches is usually ideal, so to keep the brunt of the heat away from the fabric. In addition, keep the steamer moving, as it can cause a problem if it's in one spot for too long. On a special note, if you're working with something that has an embellishment or some kind of print, you'll need to take careful measures. Make sure that you turn the item inside out to avoid causing damage to that addition with the heat. Keep in mind that these items do tend to be easily damaged, so if you don't trust yourself to use the steamer on them, it's better to seek out professional help than to damage them by accident. However, if you do feel confident then just make sure to be careful while you work. When you use a steamer, you can clean and de-wrinkle a greater variety of clothing types than you can with a standard iron. However, that's not to say that irons don't retain their own merits. Generally speaking, steamers are less likely to cause damage to your more delicate fabrics. When you're cleaning or removing wrinkles from something that has a more durable fabric, such as denim or cotton, then an iron can work perfectly well. This is especially true when you're dealing with creases within the clothing. That said, they can be too rough on delicate items. 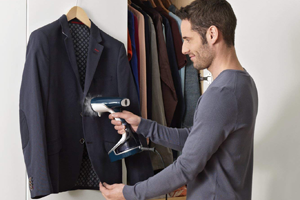 If you don't need to press your clothing, then a steamer is also a great idea. These great tools tend to be useful while your items are hanging up. As a result, you can avoid pressing creases into the items. Depending on whether or not you want those creases, you may change up your tool. If you already have an iron, then you'll likely want to keep it around for situations in which you want clothing items nicely pressed. Before you start, you'll need to prepare your steam cleaner so that it's ready to go. Make sure all of the parts on the steamer at tightly in place, so that there's no risk of leaking. Then, add cold water to the tank. After the steamer is ready, go ahead and plug it in. In most cases, steamers don't take too long to heat up, so you won't have a long wait. This can depend on your steamer, but many only take about 2-3 minutes for steam to form and the device to be fully heated. Test it to make sure that the steam is coming out well. Simply pull the trigger and watch how much steam comes out. While you do this, be careful to make sure that the nozzle isn't pointed at any part of you, or anything that can be damaged by the steam. While you're waiting for the steamer to heat up completely, you can hang up the clothing items you're going to want to use it on. Clothes that are hanging up are going to be the easiest to steam. You won't need to worry too much about holding the clothes while you work. If you're using an upright steamer, then you may find that it includes a hanging pole, which can be a useful addition for clothing or other items. Otherwise, you can use a hook, the shower rod, or a door knob. Really anything that can hold your clothing will be suitable. As you're steaming, you can just run the nozzle over the clothing in a downward motion. Don't worry about getting the nozzle very close to the clothing, as the steam is enough to get the job done. Here and there, press your trigger to add steam, which will help the wrinkles to relax. For some types of clothing, it can be useful to use a handheld pad as you work. While this isn't something you're likely to need for most items, it can be useful when you're working on clothes that are very wrinkled or dense. Another great tip for items that are extremely wrinkly is to work from underneath or inside the garment. The added weight of this process will help to get the wrinkles out more effectively. If the clothing items have ruffles or other embellishments, keep the nozzle a couple inches away to avoid damage. Naturally, your clothing is going to end up a bit damp after you've steam cleaned it. There can also be some small water spots, which shouldn't be alarming. It's a completely normal part of the process considering the use of water to de-wrinkle the item. As a result, it's important to allow the garment to sit for at least a few minutes so that it can dry out. Typically, just a few minutes can be enough to complete the task. However, if you can provide more time to allow it to dry, then it's generally the better option. When you're choosing a steamer, you'll want to think about the ways in which you might need to use it. There are a wide variety of options that you can use a steamer floor, from clothing to floors and other surfaces. Consequently, you'll want to pick the option that suits your needs the best. If you're just looking for something that you can easily carry around for quick clothing jobs, then a handheld option can be perfect. However, if you want something for at home, or for highly versatile use then you may need an upright with a bit more power. While you're making the decision, you'll also want to consider the amount of space you have to offer. Upright devices can sometimes take up a lot of space, so they can be difficult to travel with. Meanwhile, handheld steamers are much more compact and easy for travel. Check here our guide on the best clothes steamer. Upright steamers can also be known as floor steamers, because their base does sit on the floor. In this base rests the water tank, which is often bigger than you'd find in a handheld model. Attached to that is a pole and nozzle that are used for the actual cleaning. If you only plan on using the steamer at home, an upright option can be very useful because they provide a lot of power and versatility. With one single tool, you can handle clothes, floors, drapes and much more. Just perfect for cleaning your whole home! Furthermore, if you have large jobs then this is also a fantastic option. They typically have a large tank, so you won't have to worry about refilling too often when you need to clean the whole house or a large amount of clothing. This is more convenient than a handheld option, which may require many refills. Keep in mind as you're shopping that upright steam cleaners are among the most expensive, but they also tend to include a wide variety of attachments to allow you to clean in a number of ways. Consequently, it's a good idea to make sure you get one with the attachments you need. If you need something with a bit more portability, then a handheld is the best idea. For example, if you need something for travel, then a handheld is perfect. It's very easy to pack or just store in your vehicle for use while you're out on the road. Check our selection of best steam cleaners for Car. With a handheld steamer, you get a smaller water tank but it's a much lighter device, and therefore easier to use. You can even get some options that have different kinds of attachments to help with different aspects. However, you will likely need to refill more option. In some cases, a handheld option can include a mitt-type strap that you can use while steaming. This is useful for keeping your hand safe from the heat involved in the process. Furthermore, a handheld option is typically less expensive than an upright, and better for those on a budget. Take a look at other product reviews and shop for the best handheld steam cleaners available online. While a steam cleaner is a fantastic option overall, there can still be times when a clothing iron may be more suitable for a task. Steamers can get wrinkles out of your clothing, but according to SF Gate, they cannot leave your clothes with the crisp result that an iron can. Consequently, it's going to be key that you have both if you want to crease or press your clothing. However, if that isn't a big deal to you then a steam cleaner might be enough by itself. For the best of both worlds, it's a good choice to have both options available to you. Fabrics that are safe for steaming are silk as well as silk blends, anything that is wool-like including wool blends and wool itself, cashmere, cotton and other more durable types of fabrics out there. While you're steaming, you'll want to avoid any garment that contains plastic, suede, or jackets that have been waxed, as they can receive damage from the steam. If you're working on something that has a lining, it helps to steam that part first. Also, work from the top toward the bottom of the garment. For your own safety, it's important to avoid steaming any clothing item while you're wearing it. The steam will easily burn your skin. Make sure to keep the steamer a few inches away from extremely delicate items, but closer to durable ones. Steaming works best if the clothing is dry when you begin the process. Steamers can assist with keeping clothes clean, but aren't meant to replace the traditional washing process. Make sure that you empty out your water tank after every use, otherwise it can be prone to growing mold. And, of course, get a steam mop! Steam mops are vastly more efficient than steam carpet models, as we explain else where on this site. Learn more about them and see our current recommendations by visiting our homepage!